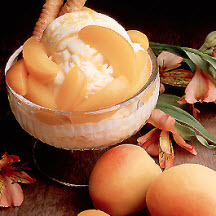 For a deliciously refreshing low-fat dessert, try this homemade apricot frozen yogurt. Combine milk and gelatin in large saucepan. Heat, stirring often, until gelatin dissolves. Add sugar; heat until it dissolves. Using a wire whisk, stir in apricots, nectar, yogurt, and vanilla. Cool. Pour mixture into ice cream maker; freeze according to manufacturer's directions. Nutritional Information Per Serving (1/2 cup): 75 calories, 2 g protein, 17 g carbohydrates, 18 mg sodium, .5 g fat, 1 mg cholesterol, .5 g dietary fiber, 445 IU vitamin A, 126 mg potassium. Recipe and photograph courtesy of California Fresh Apricot Council.